A former Walsall mayor died in hospital on election night after a short illness. 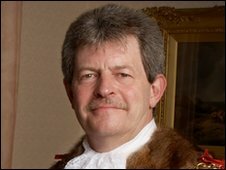 Melvin Pitt, who was Conservative member for Bloxwich West, was first elected in 1976 and was Mayor of Walsall in 2006. The 56-year-old made headlines when he made his 16-year-old daughter Abi his mayoress for his year of office. Council leader Mike Bird paid tribute to Mr Pitt, describing him as hard working and a popular member.